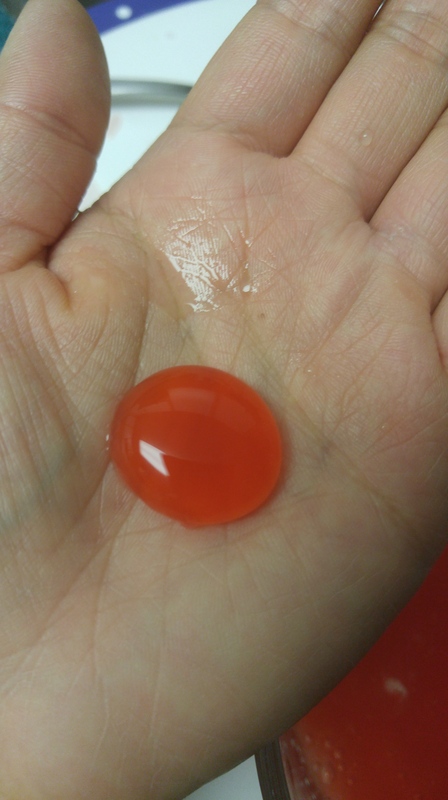 Molecular gastronomy is still growing. There are more and more recipes that involve food and science. Using what we know about the physical and chemical changes of food to create mind blowing dishes. Here is a simple recipe to get you intrigued with molecular gastronomy. This technique is also used to create fake caviar. The two chemicals you will need is sodium alginate and calcium chloride. Sodium alginate is something that is found in brown algae (seaweed) and is used in various food items such as pimentos and jams. Calcium chloride on the other hand is a salt and is used to brine things such as pickles and making tofu. Food grade sodium alginate and calcium chloride can be ordered online or found at specialty food markets. When you combine both of these chemicals, something magical happens. Start by making the two solutions. For the sodium alginate, start with 1/2 cup of warm water. Add 1/4 tsp of sodium alginate. Stir in the sodium alginate in slowly because it does clump up. Alternatively, you can use a blender and blend it into the water. As soon as the sodium alginate mix with water, it will start to absorb the water making it turn into a gel consistency. At this point, you can mix in a flavoured drink mix. 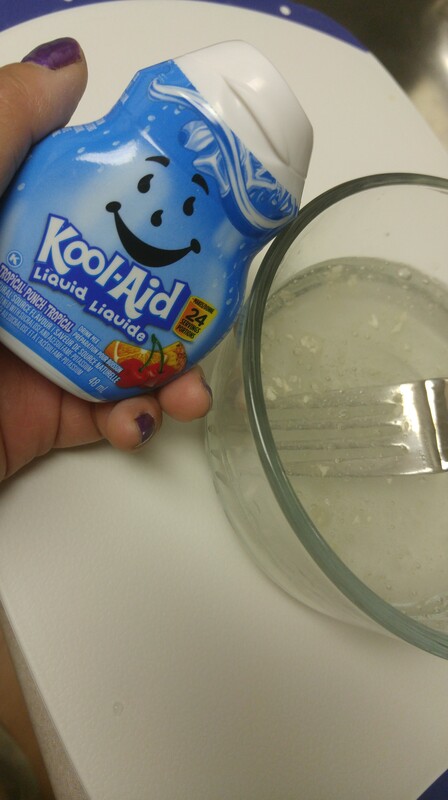 I’ve used Koolaid to flavour the gummy worms. Add about a Tbsp of the drink mix. Set aside. To make the calcium chloride solution, take 2 1/4 cup water and mix with 3/4 Tbsp of calcium chloride. Stir until the calcium chloride has dissolved. Now comes the fun part!! Fill a clean syringe or squirt bottle with the sodium alginate solution. Carefully squeeze a stream of the sodium alginate mixture into the calcium chloride solution. As soon as they touch, they will undergo a chemical reaction and create edible gummy worms. 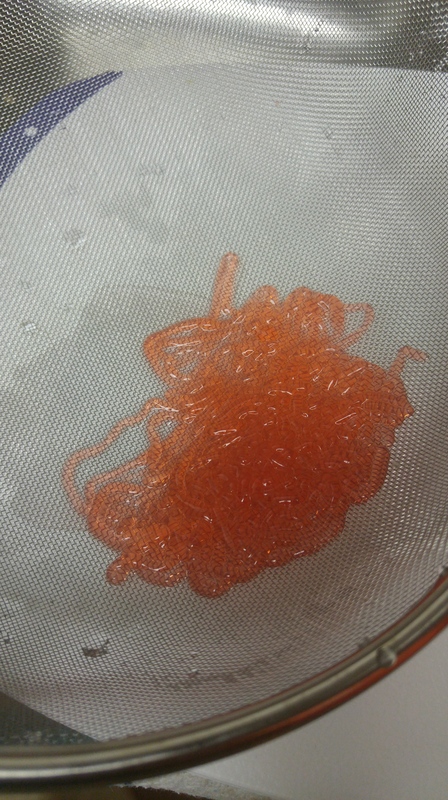 Leave the gummy worms in the water for a minute and then using a strainer, fish out the worms. Give the worms a good rinse as the calcium chloride is salty. Make a couple of worms and place in a bowl! Serve to unsuspecting guests and see if they are brave enough to try your creation. Remember you can always eat it now or eat it later.